Once upon a time, the height of sandwich creativity was Dagwood Bumstead’s creations in theBlondie cartoons: multi-layered architectural miracles constructed of cold cuts, cheeses, veggies and sliced bread. Bigger, better with a “new-and-improved” postwar mentality, it was a testament to utilitarianism taken beyond its natural extreme. It was “American exceptionalism” in sandwich form. But as Normal Height’s Burnside (3375 Adams Ave.) demonstrates, creativity need not come from “more” nor rely on structural engineering expertise. Take Burnside’s Porchetta Cubanosandwich. Cuba’s traditional version of the ham-and-cheese sandwich includes both ham and roasted pork along with Swiss cheese, pickles and mustard on pressed Cuban bread. Burnside’s uses porchetta, a glory of Italian charcuterie featuring layers of meat, fat and skin rolled together and roasted. Using porchetta achieves a similar fat-to-lean ratio to the inclusion of ham and lean pork loin. The chimichurri—a non-traditional accompaniment—worked perfectly, resulting in a creative and tasty take on the Cubano. Burnside wasn’t quite as successful with its salt & pepper po’ boy, a cross between a traditional New Orleans shrimp po’ boy and San Diego’s increasingly ubiquitous take on Chinese chicken wings. The Cajun flavorings give way to a Vietnamese chili garlic sauce, a reference to the Vietnamese influence in both Louisiana and Southern California that also picks up on the garlic chili paste used in salt-and-pepper chicken. The concept? Great. The execution: Not so much. The shrimp were slightly underdone and the ginger aioli made little more than a cameo appearance. The Kimchi Jong Ummm, on the other hand, is excellent in both conception and execution. Aside from the pun (which is a really good start) and the liberal notion of what a sandwich is, it’s a take on David Chang’s signature pork bun dish at Momofuku Noodle Bar in New York. 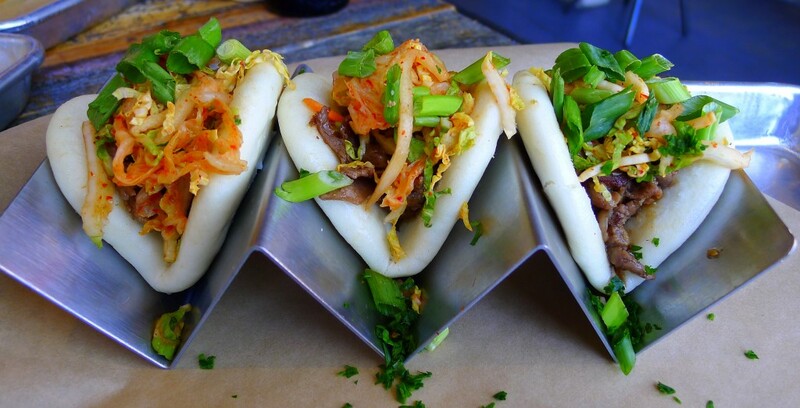 At Burnside, instead of roasted pork belly, the Chinese steamed buns are filled with the fixings of a Korean BBQ meal: thin slices of ribeye in a Korean BBQ sauce, kimchi slaw and a sprinkling of sliced green onions. There is nothing about this dish that does not work, save for the fact that I want more of it. Maybe the best sandwich at Burnside is the Bahn Miho, collaboration between the restaurant and the Miho Gastrotruck. It is their take on a classic Vietnamese sandwich of meat on baguette with cucumber, pickled carrot and daikon and chiles. The sandwich features pork (both lean loin and ridiculously luxurious pork belly), fresh (if not particularly pickled) bean sprouts and julienned carrots along with a hit of heat from the jalapeño chile. What puts the dish over the top is a “pho” dipping broth that linguistically sends Vietnam back to its colonial masters in the form of au jus.